On Christmas Day 2013, Matt Smith regenerated into a very different actor. Arguably no more drastic a change personality-wise than it was from Christopher Eccleston to David Tennant two regenerations ago, but certainly a world apart from youngish David Tennant to the even younger Matt Smith. 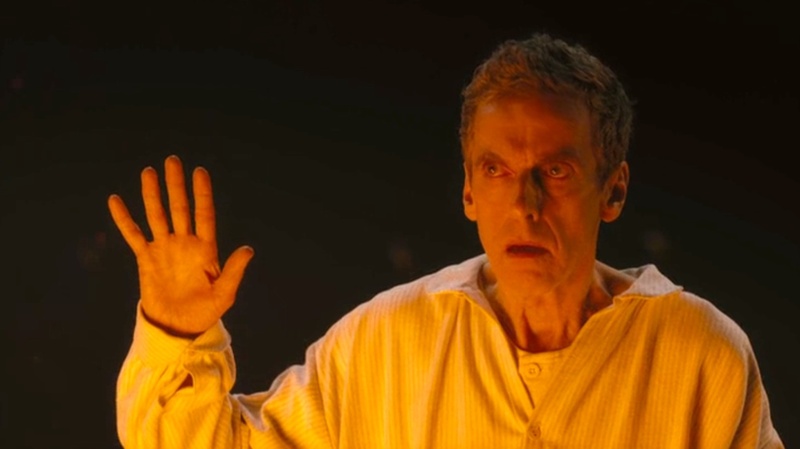 I doubt anyone really doubted Peter Capaldi’s acting abilities when he took on the role of the Twelfth Doctor, but there were questions about what his advanced (at least, compared to Smith and Tennant) age and perceived spikiness (thanks, mostly, to a certain Mr Tucker) would mean for DOCTOR WHO’S future. With the opening episode of Season 8 of the revived series, many of these questions have been answered, and though plot-wise it was a relatively stripped back affair, showrunner Steven Moffat being showrunner Steven Moffat couldn’t resist starting to lay his trail of narrative breadcrumbs for this season’s story arc. Capaldi was spellbinding from the off, taking forceful ownership of the character and the show as a schizophrenic Doctor staggering out of a crashed TARDIS, then as his mind more-or-less-settled, he became something equally compelling, sympathetic, scary and funny. The Twelfth Doctor been described in the press coverage leading up to broadcast as not caring much for humanity anymore. Not much evidence of that so far, though he does seem particularly indignant (much like Tennant’s Tenth) at cruelty towards non-humans. There’s some nice humour from Capaldi too, from the frequent references to his accent crossing the boarder (and everyone else’s accents therefore having “a defect”), and some light self-deprication about his angry eyebrows and his new appearance not exactly being box fresh, including the wonderful question he poses himself after looking in a mirror: “who frowned me this face?”. He also has a great, if fleeting moment of subtle performance, when the Doctor shows the episode’s antagonist his reflection to make a point, and in the process catches a glimpse of his own new face and seems to be holding back a shudder. Capaldi appears to (whether consciously or not) be referencing previous incarnations of the Doctor – a bit of Tennant here, a bit of Eccleston and Baker (both) there – but he also manages to bring across aspects to the character that have never really been touched upon before. Usually, when the Doctor regenerates, his companions are confused at first, but quickly come to accept his new appearance. In Deep Breath, Clara takes the full episode to get used to the new Doctor, and even then she isn’t too sure. Her whole world has been transformed in a split second, her dashing young friend is gone forever. It’s not like Billie Piper’s Rose whose relationship with the Doctor remained more-or-less the same as he hopped back a few years and grew some hair gel. Coleman has a tough job bringing this across but seems to relish the challenge, and Clara doesn’t behave in the most admirable or understanding way, much to Madame Vastra’s chagrin. Capaldi meanwhile makes us realise something new about the Doctor – when he changes, he’s just as scared and confused as his friends are, and he needs their support to get through it. At the finale, the emotional crescendo of the episode peaks as the Doctor heartbreakingly wills Clara to see that he is still the same person. It’s a pretty clever episode about concepts of identity, with plenty of food for thought about a very human trait – being shallow. It was also a really funny episode, among Moffat’s best, and not overly smug as his humour can tend to be. The return of the Paternoster Gang always helps, and spending more time with Vastra, Jenny and Strax always makes episodes fly by. Strax still gets most of the laughs as usual, and Vastra and Jenny remain an appealing couple. The group’s presence and the entertainment value they provide almost makes me wish for another Earth and time period-bound season like the we saw in the Pertwee era. As for the new stylistic embellishments, Ben Wheatley, master of disturbing British independent cinema, brings sweeping, trippy flourishes to his cinematography, and a macabre and unhinged tone to the first of two episodes he’s been invited to direct. Obviously, he can’t really bring much of his love of depravity into play when the whole family is watching, but there is a scene with the Doctor crawling around on the floor like a feral dog in an unlit bedroom, and the episode’s plot, which references one of Moffat’s earlier stories, covers just the kind of creepy material Wheatley’s films do. This entry was posted in Film, Film Review, Television and tagged Ben Wheatley, Catrin Stewart, Christopher Eccleston, Colin Baker, Dan Starkey, David Tennant, Doctor Who, Film, Jenna Coleman, Jon Pertwee, Matt Smith, Neve McIntosh, Penny Dreadful, Peter Capaldi, Sci-fi, Steven Moffat, Television, Tom Baker. Bookmark the permalink.